We provide you will a full selection of frames, handles, base plates, wheels and accessories. 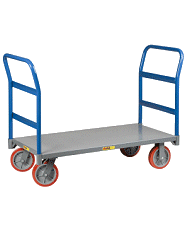 Build the hand truck that is right for your needs. All Liberator Hand Trucks come with a 2 Year Warranty! Straight Loop 55" Overall Single Grip at 46"
Straight Loop 60" Overall Double Grip Loop at 46"
C1 - 14" x 7.5" C2 - 18" x 7.5" C3 - 14" x 7.5" C4 - 14" x 9"
C5 - 18" x 7.5" C6 - 18" x 9" C7 - 14" x 10" C8 - 16" x 12"
C9 - 20" x 12" C10 - 20" x 9" C11 - 14" x 9" C12 - 14" x 7.5"
C13 - 18" x 7.5" C14 - 18" x 12" C15 - 18" x 10" C16 - 14" x 7.5"
Remove loads easy and get under loads easy. For use with E1L stair glides (not included). 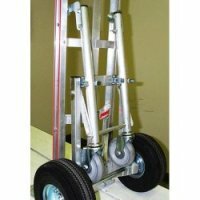 Fixed Wings 34" L x 2" W Increases Hand truck Frame width by 4". Takes the load bearing responsibility off the operator and puts it on the hand truck. This extra set of wheels secures easily to the back of the frame. 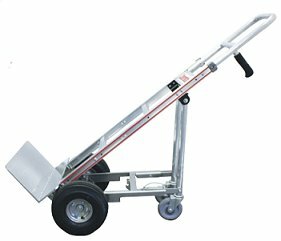 When the hand truck is tipped back, these extra casters support the load instead of making the operator support it. This accessory is a must for the frequent transport of heavy loads. Go ahead and order now.